This species of hosta from China has been grown in home landscapes in the United States for a hundred years or more. It is known for its large, pure white, fall blooming (late August into September) flowers which are very fragrant. A large size (25 inches high) plant, it has shiny green foliage and the flowers are trumpet shaped. According to The Hostapedia by Mark Zilis (2009), this plant had many Latin names over time including Funkia alba grandiflora, Funkia cordata, Funkia japonica, Funkia liliflora, Funkia subcordata grandiflora, H. plantaginea cordata, H. plantaginea 'Grandiflora', Hosta subcordata and Hosta subcordata grandiflora alba. Mark Zilis (2009), also stated that this species "...forms seed pods reluctantly and, even when it does, there are few viable seeds...The double-flowered 'Aphrodite' is the only known garden sport...All of its other sports originated in tissue culture." Its common names included August Lily, Corfu Lily, Fragrant Plantainlily, Large-flowered Fragrant Plantainlily, Subcordate Plantainlily and the White Plantainlily. From the Field Guide to Hostas by Mark Zilis (2014), "...stands out as perhaps the most horticulturally significant hosta of the last 200 years...Any hosta with fragrant flowers can be traced back to H. plantaginea, as it is the only fragrant species. At the same time, there are also many non-fragrant hybrids out of H. plantaginea." 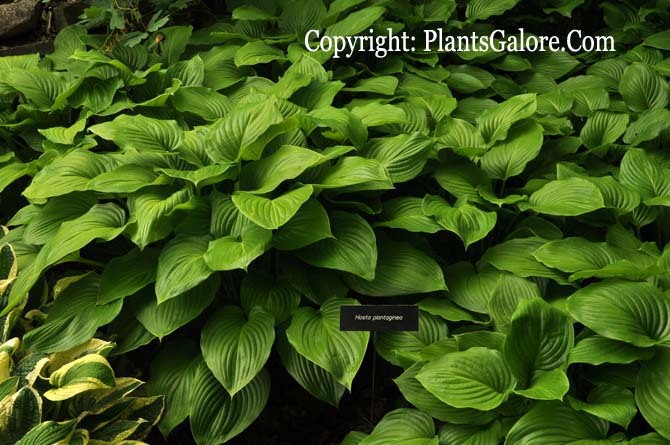 The New Encyclopedia of Hostas by Diana Grenfell (2009) states: "Leaves turn chartreuse in the sun...Leaves take several weeks to completely unfurl after the shoots first sprout. It passes on its sweet fragrance to many hybrids...Does not produce many flowers in cooler climates where it does best planted against a sunny wall. Known affectionately in the United States as grandmother's plant...Intensely fragrant, nocturnal, waxy, long tubed white flowers." Writing about H. 'Yae-no-oba' by Warren I. Pollock in The Hosta Journal (2001 Vol. 32 No. 2) states that, "This cultivar is a selection of H. plantaginea 'Aphrodite' growing in Ralph "Herb" Benedict's garden...according to Ron Williams of House of Hosta in Green Bay, Wisconsin, who introduced it, is a "vast improvement over H. plantaginea 'Aphrodite' as it blooms profusely each year"...(Pollock continues) I've also found that these H. plantaginea plants flower better if the weather is hot: in the upper 80s and higher along with high night temperatures...."Yae" means "to have two of something" in Japanese, in other words "double"..."
An article about flower fragrance by Dr. Ben J.M. Zonneveld of the Netherlands in The Hosta Journal (2002 Vol. 33 No. 2) states that, "As far as I know, H. plantaginea is the only fragrant hosta species. All of the more than 50 other fragrant hosta cultivars are hybrids of plantaginea...Where I live, near the coast of The Netherlands, the average summer temperature is only about 18°C (65°F). This means that plantaginea has so far only flowered once for me in five years." Bill Meyer in The Hosta Journal (2003 Vol. 34 No. 1) states that, "H. plantaginia...has contributed all the fragrance found in modern hybrids...It is unique in continuing to produce new leaves until it blooms, it tends to add vigor and size to its hybrids, it gives increased flower size and almost always fragrance and it performs well in warmer climates. There are a few serious negative traits...the worst is that it is very difficult to combine with other species...adds markedly decreased frost-resistance...trouble blooming in cool-summer climates, very poor fertility in later generations and a strong resistance to blue waxes and lutescent yellow coloring." W. George Schmid in The Hosta Journal (2006 Vol. 37 No. 1) says, "Fragrance is obviously simple to attain. H. plantaginea must be in the mix to create fragrant hybrids. Some Japanese booklets claim that other hostas are also purveyors of fragrance in hybridizing, but I will believe it when I smell it." An article about favorite flowering hostas by Steve Chamberlain in The Hosta Journal (2006 Vol. 37 No. 2) says, "My four favorites are: (1) H. plantaginea - when it blossoms, there is just nothing like it. Size, purity of white, fragrance! (2) H. ventricosa - the ark purple gets me every time. (3) H. 'Academy Flora' - the pale lavender flowers are arrayed 360° around the short scapes. You can grow this one for the flowers in a non-hosta garden. (4) H. 'Matthew J. Walton' - an H. ventricosa hybrid...with very large leaves and very large bell-shaped blooms. The color isn't quite as dark as the species, but the scapes are fairly tall and the flowers spectacular." In The Hosta Journal (2006 Vol. 37 No. 2) W. George Schmid comments on his favorite flowering hostas, "The best flowers are on H. plantaginea and its multi-petalous cousins, 'Venus' and 'Aphrodite'...H. capitata in bud is fine, but its offspring, 'Nakaimo' has flowers that begin with the shine of precious porcelain and stay closed in bud longer...H. kikutii forms all have fine and late flowers, but the best are on H. kikutii var. densa (H. densa). They are white and form a tight bunch at the top of the scape. H. laevigata has large, spidery flowers in abundance; its cousin H. yingeri has smaller ones with the same spidery character and dark color. These spidery flowers are carried all around the stem unlike other hosta flowers that, "lean to one side...Finally, mature clumps of 'Blue Angel' and 'Elegans' have a beautiful flower display when many flowers on different scapes open in unison..."
In an article in The Hosta Journal (2016 Vol. 47 No 2), the author described this plant's flowers as having a "Very Strong" fragrance compared to other hostas. This plant may have been sold at one time as Mackwoods No. 14.